Kansas City, Mo. — The American Public Works Association announced today that four public works fleet professionals recently earned the Certified Public Fleet Professional credential. The CPFP credential is for the seasoned government public fleet manager and for those professionals who supervise, manage, oversee or administer fleet services within or for a public fleet entity. The APWA CPFP program has certified 100 Certified Public Fleet Professionals in North America. The most recent are: John Cady, CPFP, Palm Bay Public Works, Palm Bay, Fla.; Don Christenson, CPFP, City of Crystal Lake, Wonder Lake, Ill.; Steven Mangold, CPFP, USC Sol Price School of Public Policy Wilmington, Calif.; and Joel Senical, CPFP, Hillsborough County, Riverview, Fla.
Farmington Hills, Mich. — John Davis, the Emmy Award-winning host, executive producer and creator of “MotorWeek,” will serve as master of ceremonies at the 2015 Green Truck Summit. As emcee he will introduce presenters for the summit’s alternative fuel, advanced technology and regulatory update educational sessions, and offer his own insights on clean vehicles. Held in conjunction with The Work Truck Show 2015, the Green Truck Summit provides real-world answers for many of the fuel and productivity questions fleet operators are asking. It takes place March 3–4 at the Indiana Convention Center in Indianapolis, Ind. The Work Truck Show trade show floor is open March 4–6. Connect with the ntea on Facebook at www.facebook.com/ntea. The Association For The Work Truck Industry, and join the Work Truck Show conversation on Twitter at @WorkTruckShow and with the official Work Truck Show and Green Truck Summit hashtags #wts15 and #gts15. Stevensville, Md. — Vehicle lift leader Stertil-Koni announced in November the debut of the second episode of its recently introduced customer-focused video series spotlighting unique customer applications of the company’s award-winning lifting systems. The new video, titled “We Care: Proudly Serving Transits,” features customer reaction to the performance of Stertil-Koni heavy-duty vehicle lifts in the demanding environment of transit agency maintenance facilities. It was filmed live and focuses on Kitsap Transit, based in Bremerton, Wash., and Cities Area Transit in Grand Forks, N.D.
“We Care II: Proudly Serving Transits” can be viewed at vimeo.com/109517271. Kansas City, Mo. — Five public works professionals have recently earned the American Public Works Association Certified Public Infrastructure Inspector credential. Since its inception, the APWA Public Infrastructure Inspection Program has credentialed a total of 252 U.S. and Canadian professionals with the CPII certification. The most recent APWA Certified Public Infrastructure Inspectors are: Caleb Edwards, CPII, MS Consultants, Indianapolis, Ind. ; Shayne Lopez, CPII, city of Scottsdale, Mesa, Ariz.; Brad Minnick, CPII Primera Engineers Ltd., Munster, Ind. ; Anthony Riddell, CPII, city of San Carlos, Calif.; and Anthony Williams, CPII, Harris and Associates, Las Vegas, Nev. For information on the CPII Certification program, the Certified Public Fleet Manager or the Certified Stormwater Manager programs, contact APWA Certification Manager Becky Stein at (816) 595-5212 or bstein@apwa.net. Washington, D.C. — The Institute for Sustainable Infrastructure, a nonprofit 501(c)3 organization that launched the Envision sustainable infrastructure rating system for public and private owners, and Skanska, one of the largest construction and development companies in the country, announced a new U.S. partnership in December. With the partnership, Skanska has committed to aligning the delivery of heavy infrastructure civil projects with efforts to ensure the social, economic and environmental sustainability of the communities where they are built. ISI has agreed to provide opportunities for all Skanska employees to receive training and credentialing in the Envision Sustainability Professionals credentialing program. When credentialed, these employees will be able to document and rate sustainability aspects of infrastructure projects in collaboration with ISI’s Envision infrastructure rating system. With the Envision credentialing effort, Skanska will continue its commitment to embed sustainability throughout its infrastructure practices. Stevensville, Md. — Stertil-Koni, the leader in heavy-duty vehicle lifting systems serving transit agencies, fleets, municipalities, public utilities and the U.S. military, announced Dec. 4 that Robyn Collier has been named warranty coordinator, in addition to her current role as receiving manager. 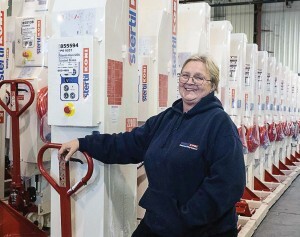 Collier, a nine-year veteran with Stertil-Koni, brings substantial hands-on product knowledge in addition to a dedicated customer focus to her expanded responsibilities with Stertil-Koni. Previously, she served with Stanley Black & Decker for more than 20 years, capping off her career there in a warehouse management position on the Eastern Shore of Maryland.